As with the original polos, the new Logan, Holden and Torrey Polos are equally welcomed around the town as they are on the links. 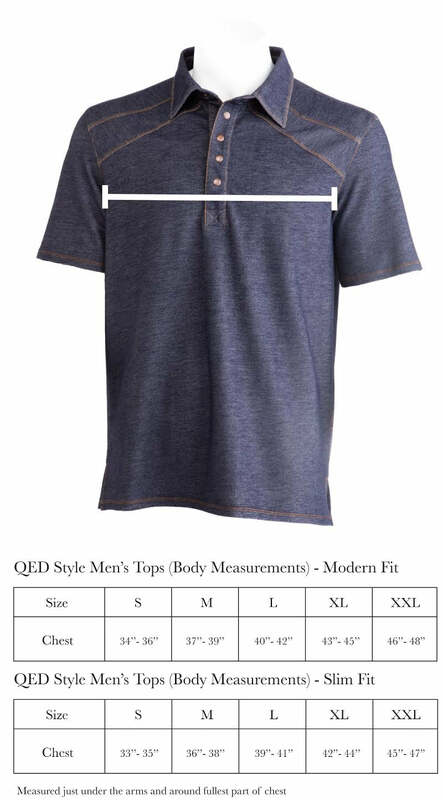 The Logan Polo is our premium 100% polyester performance shirt that features contrast stitching and the now standard QED square emblem on the back yoke. For those who prefer cotton, the Holden Polo is made from 95% cotton and 5% spandex and looks great tucked in or worn after hours with a pair of jeans. Fans of the traditional polo will love our new super soft 100% cotton Torrey polo. Classic style with updated cut and details. Pop the collar to reveal a diamond pattern that will garner wows from your foursome. With the success of the polos, we decided it was time to release an after hours button down called the Roy Woven. Tailored fit, horn snap buttons and the QED emblem on the back will let everyone know you are a man of style. Beyond the new polos, QED now offers water resistant pants and shorts all of which are made to last through seasons of beaten balls and hikes in the woods. We designed these pants and shorts to meet the style requirements of golfers as well as the performance needs of the outdoorsmen. Finally, we rounded out the 2013 line with the Alta Fleece and Newton Sweater. The Alta Fleece is made with 100% Merino wool and features a white reflective stripe down the right sleeve. Perfect for fall golf, hiking or skiing, this pullover is as fashionable as it is warm. For the days when you need just a little extra warmth, the Newton Sweater is a perfect compliment. Made from 85% cotton and 15% Merino wool, this v-neck sweater is crazy soft and looks great over a collared shirt. All of these items are available online.